The thought of Christmas cookies brings back a flood of warm memories: the childhood delight of baking with my mother or grandmother, the joy of receiving a tin of cookies from a friend or even the pleasure of baking cookies for a friend. If cookie baking doesn’t always live up to your expectations, try incorporating the below tips to help bring the fun back into cookie baking. For evenly browned cookies, use shiny cookie sheets, if possible. If using dark cookie sheets, reduce the original suggested cooking temperature by 25ºF. Dark sheets absorb heat and make cookies brown more on the bottom. When making drop cookies or cookies rolled into balls, it’s nice to use two cookie sheets. You can be preparing the next batch while the first batch is baking. If you only have one cookie sheet, let it cool before placing the next batch of dough on the pan. A hot pan sometime makes the cookies spread too much. When making cut-out cookies, try rolling out the dough on a pastry cloth. Any piece of heavy canvas fabric will do. Simply rub flour into the cloth and roll out the dough. It’s so much easier than rolling on a board. And the dough is easier to handle if you keep it chilled. Store each type of cookie separately so their flavors don’t mix together. This will help prevent the cookies from all tasting the same. Store soft cookies in a tightly closed container and crisp cookies in a container with a loose fitting lid. If it’s humid, all cookies should be stored in tightly closed containers. Here’s wishing you a wonderful holiday filled with joy and love. It would be wonderful if we all had a warm, cozy grandmother’s house to go to for the holidays. But, we know that “home for the holidays” is not really about a place, but about being with family and friends. The big holiday dinners are typically the attention grabbers, but let’s not forget about the leisurely visits around the kitchen table. For those times, it’s nice to have a few treats on hand to pull out and serve. As a reminder, the delicious treats you have in your freezer make thoughtful gifts for friends, co-workers, teachers, etc. The previous “What’s in your Pantry?” series has primarily focused on convenience products like Martha White® Muffin Mixes. Keep these mixes readily available for a quick breakfast, after school snack or a last minute dessert. This month I thought it would be a good time to make some suggestions for the holiday scratch bakers. The good news is that you probably already have everything you need for many of these recipes. Some require very few ingredients in addition to Martha White® Flour or Martha White® Corn Meal. 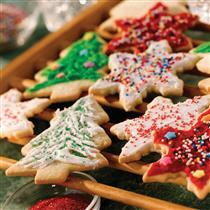 Sugar and dairy products like butter and sour cream are usually a baker’s household staple. I am often amazed at how many delicious recipes can be made with minimal ingredients and a few others like vanilla extract, spices and some nuts. Pound cakes are one of the best examples of a recipe that uses only a few ingredients. The pound cake name comes from the original recipe which was made with a pound of butter, a pound of sugar, a pound of eggs and a pound of flour. The buttery sugar cookie recipe uses virtually the same ingredients as the original pound cake. Pound cake recipes have been enhanced over the years and one of my husband’s favorites is a Brown Sugar Pound Cake. It’s made with brown sugar and features a caramel glaze, but you probably have everything you need. This is a great recipe to have on hand during the holidays because it stores well and serves at least 20. Another favorite Martha White® recipe of mine is the “Go To” Southern Corn Meal Cookies. Simple and delicious! The dough makes wonderful little tart shells that you can fill with various types of fillings. Posted on November 30, 2015 December 6, 2016 Author lindacarmanblogCategories What's in your pantryTags baking, desserts, holiday baking, Martha WhiteLeave a comment on What’s in Your Pantry? Nothing smells better or takes the chill off on a cold winter evening like hot apple cider spiced up with cinnamon and fruit juices. Try using orange, pineapple and/or maybe a punch of lemon, in your apple cider to welcome everyone home. Consider garnishing with a cinnamon stick and a slice of citrus on top. Keeping this winter favorite in mind, you may want to stock your pantry with a few packages of Martha White® Apple Cider Flavored Muffin Mix. Warm muffins will welcome everyone to the breakfast table or will serve as a heartwarming afternoon snack. This mix can easily be adapted by adding dried fruit-like raisins or cranberries’ and/or a few chopped nuts. Pecans or walnuts pair well with apple flavors. Toasting the nuts brings out a special flavor, but it’s not necessary as the nuts are good either way. I prefer to toast mine in the oven at 350 degrees, checking and stirring every 5 minutes or less to prevent burning. If you prefer the stove top over the oven, the nuts may be toasted in a skillet on top of the stove, constantly stirring to prevent burning. This Apple Cider Crisp recipe is a perfect winter dessert. Using a couple of shortcuts, like apple pie filling and Martha White® Apple Cider Flavored Muffin Mix makes this recipe a breeze to pull together. Adding cranberries to the pie filling creates a delicious sweet/tart flavor. To create the topping, add oats, brown sugar, butter, and chopped pecans to the prepared muffin mix. Serve this delectable dessert with whipped topping – it’s so good. How Do You Eat Thanksgiving Leftovers? When preparing your Thanksgiving dinner, do you make extra so there is enough to eat the next day? I did an informal survey at the office asking about favorite ways to eat Thanksgiving leftovers. Here are some great ideas for you to use as inspiration. Turkey pies made by favorite family recipe. Sandwiches – everything from straightforward basic cold turkey to turkey on whole grain bread with butter, cheese and lettuce to a hot open-face turkey sandwich with gravy…and a piece of pecan pie! Oh, and I loved this response: Leftovers? Another way to incorporate leftover turkey is in a soup or stew which is always a favorite. Give the Turkey and Smoked Sausage Stew with Cornmeal Sage Dumplings recipe a try. 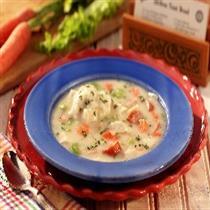 It’s a punched up version of the classic Chicken and Dumplings. A little smoked sausage adds flavor to the stew that’s complemented with easy-to-make cornmeal sage dumplings. Posted on November 27, 2015 November 16, 2015 Author lindacarmanblogCategories UncategorizedTags holiday baking, holiday traditions, Martha White, ThanksgivingLeave a comment on How Do You Eat Thanksgiving Leftovers? Potluck parties are a great way to entertain. They take a lot of pressure off the host and hostess with each guest responsible for contributing a dish to share. The host often provides meat and asks for a complementary dish – sometimes even requesting a side dish, salad, bread or dessert. This holiday season why not take dessert bars as your potluck contribution? It’s easy to make a big batch of bars. Most recipes call for a 9×13-inch pan which will make 24 or more bars per pan. Keep in mind there will likely be other desserts, so the serving size does not need to be large. Bars are easy to transport and can be served from the same pan they were prepared in or placed on a separate platter. Included in this post are two holiday bar recipes that are sure to be a hit at any potluck. The Praline Pumpkin Pie Bar recipe has a press-in crust made from scratch with Martha White® All-Purpose Flour, a spicy pumpkin pie filling and a brown sugar, pecan and butter topping. The crust for the Pumpkin Cheesecake Chocolate Chip Bar recipe is easy to make using a Martha White® Chocolate Chip Muffin Mix. Topped with a pumpkin cheesecake mixture and swirled with preserves, these bars taste as delicious as they look. Do you have a recipe you’d like to share that everyone expects you to bring to a potluck? I have a friend who is always expected to bring her fudge pie. If so, I would love to hear about your recipe. My good friend, Mary Ann, has cooked Thanksgiving dinner for her family since she was a young bride. Mary Ann is a home economist and has been a professional food stylist for many years. In addition to preparing a traditional Thanksgiving dinner, she also creates a beautiful tablescape. Who better to share tips from her years of experience? Mary Ann’s most important tip for a stress-free day is to prepare as much of the meal as possible in advance. She makes and freezes her dressing and other casseroles ahead of time and then bakes on Thanksgiving. Don’t forget to move them from the freezer to the refrigerator about 48 hours before cooking. Heat casseroles in microwave, add any toppings and finish in the oven. If using the microwave, Mary Ann suggests using oval or round baking dishes. Mary Ann prefers a fresh turkey over a frozen one. She seasons the cavity and under the skin with seasoned salt and then puts onion quarters, lemon slices, carrot pieces, fresh thyme and rosemary in the cavity. Then she butters the outside of the turkey and covers it with a butter-soaked cheesecloth. Do not cover turkey with lid or foil. She makes sure to put the turkey in early enough to have time to bake her casseroles. Mary Ann makes a traditional pumpkin pie for dessert, but sprinkles the unbaked crust with a praline mixture of brown sugar, butter and pecans and then bakes for about 5 minutes at 400 degrees. When the crust is ready, she adds the pie filling and bakes as directed in the recipe.